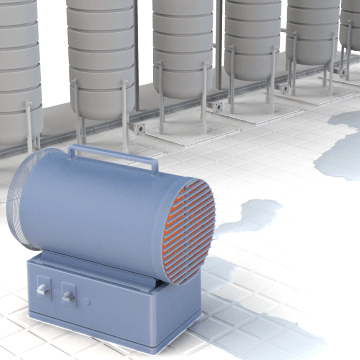 With a housing made of stainless steel, these washdown electric heaters are designed to withstand frequent washdowns as well as corrosive liquids. Great for industrial and institutional food processing and preparation environments. They use an electric air-blowing style of heat delivery (also known as fan-forced convection), which means that they have a fan to move air over a heating element and push hot air into a room to bring the space up to the desired temperature quickly. They produce more noise than radiant-style heaters, but are highly energy efficient.